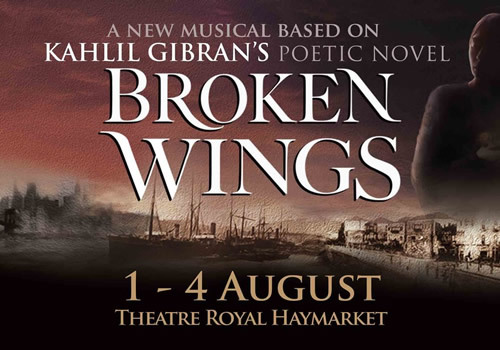 Nadim Naaman brings his major new musical Broken Wings to the stage for its London premiere, playing a strictly limited number of performances at the West End’s Theatre Royal Haymarket. Based on the works of acclaimed author Kahlil Gibran, the touching production is a semi-staged concert that features a 9-piece orchestra live on stage. Broken Wings is the autobiographical tale of the tragic love story of Lebanese-born poet Kahlil Gibran, and his 1912 masterpiece. Transporting audiences back through decades into 1923 New York, the musical sees an ageing Gibran narrating through poetry and music. Looking back over his life, his 18-year-old self returns to the Middle East to complete his education, falling in love with Selma Karamy on the way. However, Selma is betrothed to someone else; a powerful man who has his eye set on her fortunes. As Gibran and Selma fight to reconcile their love for each other, they must navigate the strict rules and traditions of Beirut society. Highlighting issues that remain strikingly relevant today, Broken Wings focuses on the fight for gender equality, the competition between wealth and happiness and the topical issue of immigration. Casting includes Rob Houchen (Les Misérables) as Young Gibran, Hiba Elchikhe (Disney’s Aladdin) as Young Selma, Nadim Naaman (The Phantom of the Opera) as Older Gibran and Soophia Foroughi (Spamalot) as Mother. Further casting includes Adam Linstead, Nadeem Crowe, Irvine Iqbal, Sami Lamine, Robert Hannouch, Nikita Johal and Lauren James Ray. Kahlil Gibran is one of the world’s best-selling poets, with his seminal work The Prophet becoming an instant international best-seller. Produced by Ali Matar, the musical features a book by West End performer Nadim Naaman, with music and lyrics by Dana Al Fardan and direction by Bronagh Lagan. Addressing key social issues that are still relevant to this day, Broken Wings is a thrilling and moving new musical that receives its London premiere in the West End. Playing a strictly limited run, the production plays at the Theatre Royal Haymarket from August 1st to August 4th 2018, with a press night on August 2nd 2018. Broken Wings is suitable for ages 8 and up.